Dr. Ogden was drawn to treating foot and ankle injuries for their intricacy, and their direct impact on patient quality of life. “Injuries of the foot and ankle are the most common injuries of any athletic endeavor, just about,” he says. “[From] the NFL to major-league soccer, 40 percent of the injuries that keep players from participating are foot and ankle injuries.” He works with both recreational and professional athletes, and he notes that, as both a physician and a sports fan, it’s doubly rewarding to help his patients heal. 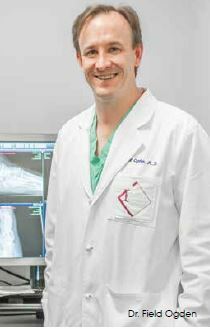 Here, Dr. Ogden explains the most common foot and ankle injuries, and the course of orthopaedic treatment for each. “The most common injury people complain about is turf toe, but it’s not as frequent as the media makes it out to be,” Dr. Ogden says. The term refers to a tear of the ligament, or connective tissue, joining the bones of the foot and the big toe; athletes most commonly sustain this injury by experiencing an impact while the foot is planted on the ground. Minor cases of turf toe can be treated with an immobilizing boot and a special metal plate inside the shoe to minimize toe extension, while more severe cases require surgery. “It’s not uncommon for people to develop arthritis in the big toe,” Dr. Ogden says. Bone spurs may develop behind the toe joint, at which point surgical intervention can remove the spurs, increase the toe’s range of motion and provide pain relief. A “sprain” refers to a ligament, or connective tissue between bones, being torn or stretched beyond its limits. These injuries commonly occur in the foot and ankle. “Sprains are fairly easy to treat,” Dr. Ogden says, noting that with the help of a brace or boot, most ankle sprains heal within two to three weeks. However, more severe sprains may require a longer healing period. When a sprain-like injury simply doesn’t heal, it may not actually be a sprain. “Ankle sprains that don’t get better after a few months are typically a sign of something else going on,” Dr. Ogden says. In this case, the doctor may perform an MRI to more closely examine the ankle’s ligaments and cartilage. Fractures are breaks or cracks in a bone. Stress fractures, or small cracks that develop over time, are commonly caused by overuse of a weight-bearing bone. “If the bones haven’t been displaced, [the fracture] can be treated [by immobilizing the foot] in a cast or boot,” Dr. Ogden says. More significant types of fractures include Jones fractures, named for British orthopaedic surgeon Robert Jones, who described the injury’s specific fracture pattern with great specificity before X-rays were able to confirm the pattern. This type of fracture occurs at the base of the little toe. Because Jones fractures are notoriously difficult to heal, they are often treated surgically. Soccer and football players are more likely to experience mid-foot injuries; while immobilizing the foot can treat some cases, surgery is required for more severe injuries. What appears at first to be a sprained ankle may be, in fact, a torn tendon — a band of tissue that connects muscle to bone. “A torn tendon, rather than a ligament, is not uncommon,” Dr. Ogden says. Athletes and other physically active people are more likely to tear an ankle tendon. Treatment involves surgery to repair the tendon, and may include physical therapy.